The Real Stories project is a multimedia collection of workforce development stories from students, faculty, and child welfare professionals at all levels. Each project provides unique, first-person insight into the impact that NCWWI initiatives and partnerships are having on workforce and child welfare practice across the country. Use these stories for lunch & learns, training, team discussions and more! Want to use these stories to inspire a rich discussion about innovative workforce development initiatives? Download the Real Stories Tool Kit which details the topics and themes of each story, along with questions to inspire critical thinking and guide a thoughtful discussion. 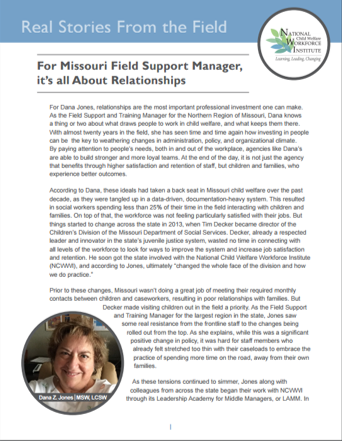 Dana Jones, a Field Support and Training Manager in Missouri, was facing high staff turnover rates and an over-stressed child welfare system in her region. Through the LAMM, she developed a change initiative that has made a big impact on worker satisfaction, and ultimately, outcomes for children and families.